Little Guys - Little Bunny Boy This item is on sale. FROM STORE OVERSTOCK, NEVER USED...From Amy Bruecken Designs, how could you say "no" to this adorable bunny stitched on Fabric Flair's 28ct Yellow Stripe with Silver Sparkle evenweave fabric. Uses DMC floss and has a stitch count of 34 x 75. Add wool felt to the back, stuff, and attach a pom pom to the back for extra cuteness! Little Guys - Little Bunny Egg This item is on sale. FROM STORE OVERSTOCK, NEVER USED...From Amy Bruecken Designs, with bunny ears and saddle shoes, this little egg is ready for Easter! Shown stitched on Fabric Flair's 28ct Pink Dot with Silver Sparkle evenweave fabric. Uses DMC floss and has a stitch count of 37 x 72. Little Guys - Little Bunny Girl This item is on sale. FROM STORE OVERSTOCK, NEVER USED...From Amy Bruecken Designs, this little PEEP is shown stitched on Fabric Flair's 28ct Yellow Stripe with Silver Sparkle evenweave fabric. Uses DMC floss and has a stitch count of 34 x 75. Add wool felt to the back, stuff, and attach a pom pom to the back for extra cuteness! Little Guys - Little Easter Chick This item is on sale. FROM STORE OVERSTOCK, NEVER USED...From Amy Bruecken Designs, this little chick is ready for that Easter Basket stitched on Fabric Flair's 28ct Purple Dot with Silver Sparkle evenweave fabric. Uses DMC floss and has a stitch count of 45 x 65. Little Guys - Mitten Man This item is on sale. FROM STORE OVERSTOCK, NEVER USED...From Amy Bruecken Designs, stitched on 28 count White with Silver evenweave from Fabric Flair using DMC floss. Stitch count is 35 x 63. Little Guys - Sammy Sock This item is on sale. FROM STORE OVERSTOCK, NEVER USED...From Amy Bruecken Designs, stitched on 30 count Parchment linen using DMC floss. Stitch count is 31 x 70. Little Heart Humbug This item is on sale. FROM STORE OVERSTOCK, NEVER USED...From Keslyn's, little ornament or pincushion stitched on 2" 28ct natural linen banding using DMC 154. The Heart charm is included. Little House - Punch Needle This item is on sale. FROM STORE OVERSTOCK, NEVER USED...From Pine Mountain Designs, out of print chartpack is in EXCELLENT condition, with no markings of any kind and price sticker on protective plastic cover. Preprinted fabric is included. Little House Haunted, The This item is on sale. FROM STORE OVERSTOCK, NEVER USED...From Bent Creek, stitched on 32 count Natural linen using Weeks Dye Works, Gentle Art Sampler Threads, and DMC floss. Stitch count is 24 x 24. Little Lucy This item is on sale. From Mosey N Me, published 1997. Chart is in EXCELLENT condition, appears never used, with no markings of any kind and price stickers on front cover. Little More Seasoning, A This item is on sale. From The Cricket Collection, chart is in EXCELLENT condition, appears never used, with no markings of any kind and price sticker on front cover. Little Prince This item is on sale. FROM STORE OVERSTOCK, NEVER USED...From Widgets & Wool Primitives, greet that little prince in your life with this design stitched on 28ct Blue Parisian Stripe linen using Gentle Arts Blue Jay and DMC white. Works up to approx 4 1/4" x 4 1/2"
Little Prince Birth Sampler This item is on sale. FROM STORE OVERSTOCK, NEVER USED...From Stoney Creek, stitched on 28 count White Monaco using DMC floss, DMC Perle Cotton, DMC Color Variations, and Mill Hill Beads. Stitch count is 59 x 88. Little Red Bird - Estelle This item is on sale. FROM STORE OVERSTOCK, NEVER USED...From Myrtle Grace Motifs, this little stitched birdie design is shown stitched on 30ct Linen linen from Weeks using Weeks Dye Works fibers. Stitch count: 70 x 47. 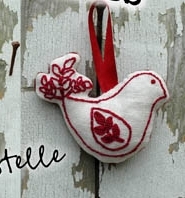 Little Red Bird - Estelle (Punch) This item is on sale. FROM STORE OVERSTOCK, NEVER USED...From Myrtle Grace Motifs, this punch needle design comes already printed on weavers cloth - you supply the 7" hoop, 3-strand needle and Weeks Dye Works (or DMC floss). Works up to 4.75" x 3.75". Live Each Day With A Smile This item is on sale. FROM STORE OVERSTOCK, NEVER USED...From Val's Stitchin Stuff, kitty stitched on 28ct Scuppernong Gingham linen using Weeks Dye Works and/or DMC floss with a stitch count of 42 x 57. Embellished with a ss1006L button from Just Another Button Company. Lock and Key Sampler This item is on sale. FROM STORE OVERSTOCK, NEVER USED...From Ship's Manor, stitched on 28 count Rue Green linen using DMC floss. Stitch count is 90 x 80. Long May She Wave This item is on sale. FROM STORE OVERSTOCK, NEVER USED...From Blackberry Lane Designs and charted for Army, Air Force, Navy and Marines, the ornament and the scissor fob both have a stitch count of 74 x 70 but the fob is stitched over one thread of 28ct Linen. Both are shown on 28ct White linen using DMC floss. Looney Tunes In Waste Canvas This item is on sale. From Leisure Arts, Booklet #2564, published 2000. Out of print booklet is in EXCELLENT condition, appears never used, with no markings of any kind and price stickers on front cover. Includes 21 designs. Lord Turn His Face, The This item is on sale. From Jeanette Ardern Designs, published 2008. FROM STORE OVERSTOCK, chart is in EXCELLENT condition, never used, with no markings of any kind and price stickers on protective plastic cover. Lotus Garden This item is on sale. FROM STORE OVERSTOCK, NEVER USED, WITH NO MARKINGS OF ANY KIND...From Kustom Krafts, lovely lady, lovely garden .. stitched on 14ct Antique White Aida using DMC floss with a stitch count of 231 x 273. Love This item is on sale. FROM STORE OVERSTOCK, NEVER USED...From By the Bay Needlearts, chart is in EXCELLENT condition, with no markings of any kind and price stickers on protective plastic cover. Love & Joy This item is on sale. FROM STORE OVERSTOCK, NEVER USED...From Elizabeth's Designs, chart is in EXCELLENT condition, with no markings of any kind and price stickers on front cover. Love & Kindness This item is on sale. FROM STORE OVERSTOCK, NEVER USED...From Stoney Creek's Home Series, part three includes two designs stitched on 28 count Clay Cashel linen using DMC floss and Weeks Dye Works. Stitch count for both designs is 43 x 71. Love & Luck - Punch This item is on sale.